China's HNA Group continues to find it difficult to identify profitable markets for its three all-premium A330-200 configured with 116 seats, 34 in first class and 82 in business. The aircraft were acquired to fly between Hong Kong and London on subsidiary Hong Kong Airlines, but were removed in Sep-2012 after suffering losses on the route. While a viable option may have been to reconfigure the aircraft with economy seats, the aircraft have instead been transferred to HNA's flagship investment, Hainan Airlines, and used on domestic sectors between Beijing and Shenzhen, the third busiest route in China and 24th in the world. 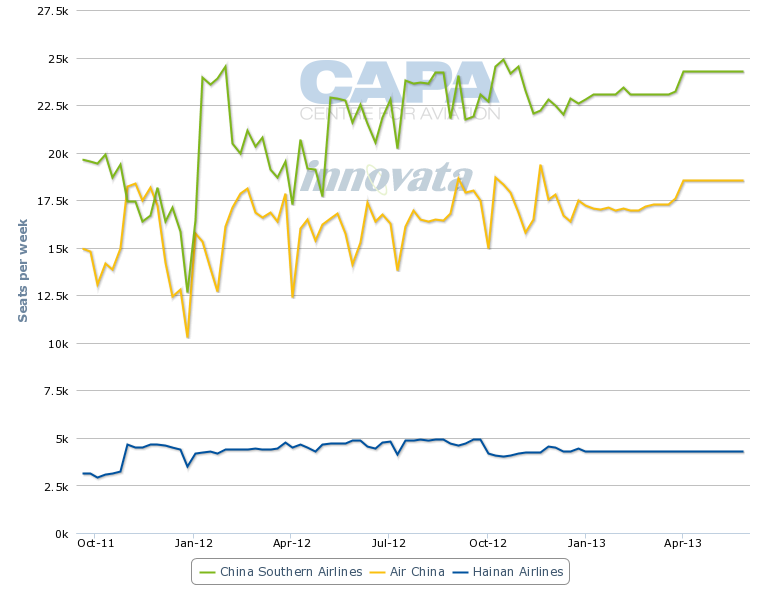 Hainan has reported initial load factors ranging between 80% and 94%, but yields have been a challenge. Premium travel in China is still developing, with fares booked in advance not much more expensive than economy. The problem is acute for Hainan's all-premium services, where premium fares are offered at less than half the price of competitors. Despite this, Hainan is considering expanding the service to Beijing-Guangzhou. Profitability will continue to be a difficult goal, at least until market share and frequencies can be established. The largest carrier on the route, Air China, has about double Hainan's capacity. Air China accounts for about 34% of the market but with upwards of nine daily services, giving it a significant frequency advantage. Services are operated by Boeing 737s and a range of widebody aircraft, some dedicated domestic/regional aircraft and others used in between long-haul services. Air China's position is further enhanced by the presence of Shenzhen Airlines, in which it has a majority 51% stake. Shenzhen Airlines accounts for about 25% of the Beijing-Shenzhen market. Shenzhen only flies narrowbody aircraft, but that includes the large 737-900. Shenzhen also offers about nine frequencies a day and uses Air China's frequent flyer programme, PhoenixMiles. Beijing-Shenzhen is the third largest domestic route in China after Beijing-Shanghai Hongqiao and Beijing-Guangzhou. Beijing-Shenzhen accounts for 2% of all of China's ASKs. The 15 largest routes in the country account for about 20% of ASK capacity. Globally, Beijing-Shenzhen is the 24th largest route based on seat capacity. Hainan has offered various comments about the Beijing-Shenzhen's route performance, saying the load factor for the first week was 94% and also that the load factor for the first eight days was "over 80%". Irrespective of the exact load factor, yields are lagging. One-day advance purchases in Hainan's business class for RMB1750 (USD281.80) one way, excluding taxes, are the same as if booked a month out, and is only 25% more than the lowest fare in the market, on Shenzhen Airlines. Hainan's business class is the same as for economy class. Hainan's fares are exceptionally low. In business class, Air China is offering one day advance fares of RMB4030 (USD649) – 130% higher. China Southern's first class fare is cheaper than Air China's (Air China generally has a yield premium over competitors), but is still twice the price of Hainan's fare. The domestic market in China is profitable (it typically offsets long-haul markets) and with handsome yields. But on the Beijing-Shenzhen service, at 1951km or 1213 miles, Hainan Airlines will struggle with weaker yields than competitors, operating aircraft with fewer seats – an unenviable combination. Its A330-200s seat 116 while Shenzhen Airlines' 737-800s/900s carry between 167 and 189, giving it both a yield and cost base advantage. When Air China uses widebody aircraft, it potentially also has a cost advantage: its A330-300s seat about 300 passengers, and the majority of those passengers will be on fares higher than passengers are paying Hainan Airlines. Hainan's flat fare of RMB1750 one way excluding taxes works out to a yield of about USD14.4 cents/km. China Southern's RMB3500 one day advance purchase fare equates to a yield of USD28.8 cents/km while Air China's RMB4900 fare is USD40.4 cents/km. 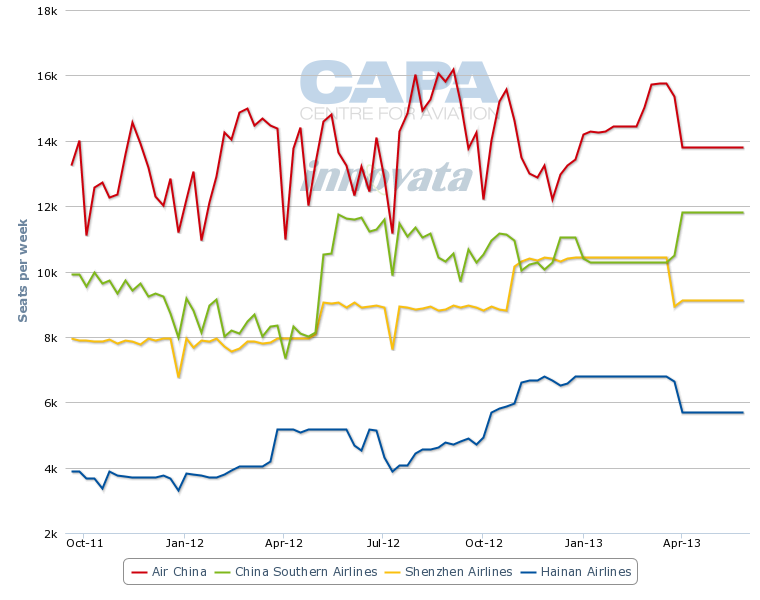 Load factors for all airlines on average are good, and typically high on trunk routes like Beijing-Shenzhen – although not as high as the levels Hainan has talked of. A further important ingredient of balanced supply and demand is the CAAC’s domestic fare regulation. It has set a price of RMB75 cents (USD12.0 cents) per one-way kilometre, with carriers allowed to charge upwards of 25% more or 45% less, giving a range of USD6.6-15.0 cents per kilometre. As evidenced by the Big 3’s domestic yields, average fares fall slightly under the target price. The CAAC in 2012 quietly suggested it would end domestic fare regulation, something it has already done so internationally. Deregulation would likely have a greater impact in the long-term than short-term, as Chinese carriers could fully hone revenue management practices, which would benefit their international markets. With domestic load factors – previously relatively low – hovering around 80%, stimulation opportunities would not be great, except perhaps for quieter periods. Fare deregulation could deliver to the domestic market the behaviour passengers are coming to expect from foreign low-cost carriers that set rock-bottom launch fares or special sale fares. Critically, Spring Airlines, the only notable domestic LCC, would gain experience with this – as would full-service carriers, who will one day have to contend with greater domestic LCC competition. Larger long-term shifts in consumer behaviour would occur once airlines were able to stimulate demand far in advance. Outside the main holiday periods, domestic tickets are typically booked close to travel: almost all about a month out, many only a week before departure. Greater indications about demand ahead of departure would allow airlines to improve their revenue management, but a far greater impact on the bottom-line would come from curtailing the bloated cost bases of the legacy carriers. There is still much to be achieved towards becoming more entrepreneurial and to taking the initiative in selling rather than largely waiting for demand to find seats. See related article: A cooling Chinese economy shakes the Big 3 out of the status quo – Efficiency efforts are sorely needed in China's domestic market amid slowing growth. Start-up low prices are not unusual in a new operation, especially where the new entrant is up against higher unit cost, bigger airline competition and so initial experience must be seen against a longer term plan. In establishing and promoting its operation, Hainan has also launched a number of promotions for its all-premium service, ranging from additional frequent flyer miles to giving away model aircraft. But under current circumstances it is difficult to see this service being profitable. And if it achieves profitability – for example during China's high-demand holiday travelling periods – the carrier has the option in future of reconfiguring the aircraft to include economy class seats. The global lesson, after all, suggests that all-premium seldom works. On the other hand, there are many features of Asia's new markets that challenge conventional wisdom, notably the extensive and very effective use by full service airlines of low cost, branded subsidiaries. The Chinese market, with its lumpy regulation and new consumer attitudes is still very much unexplored territory from a marketing and demand point of view. In these circumstances some experimentation may well be a sound strategy – provided there is room to adapt quickly if the competition proves too strong. One underlying problem across the country is developing management skills in China's young airlines; it was merely 20 years ago the regulator CAAC stopped flying its own services, opening the door to today's airlines. Government and privately owned airlines have made massive strides in the past decade, but the rapid expansion of the market has not only given rise to pilot shortages; strong management skills are increasingly very much in demand. Hainan's situation may be compared to China Southern's A380 struggles and the losses it incurred initially, but there the problem was regulatory with route availability whereas Hainan may need to make capacity/configuration adjustments to adapt to its new route. Hainan Airlines is considering increasing all-premium frequencies between Beijing and Shenzhen; this is probably a logical step, if the goal is to attract business traffic, which typically demands high frequency options. The airline will also expand the all-premium services to the Beijing-Guangzhou route, the second busiest in China. Hainan also has a minority position on this route. Should Hainan consider the largest city pair market in the country, to Shanghai, it will face stiff competition. 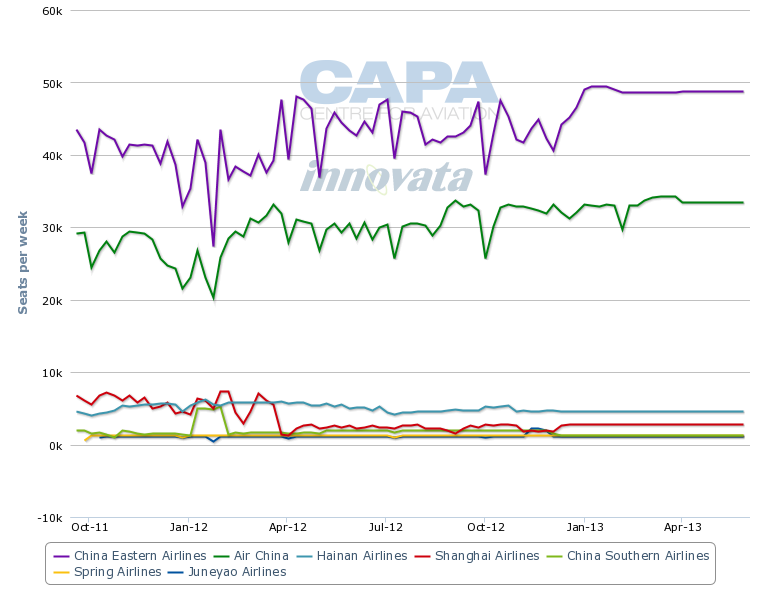 It has the third highest capacity behind China Eastern and Air China, but by a large margin. Like it or not, Hainan Airlines now finds itself in the vanguard of experimentation in testing premium demand in the domestic Chinese market. Its economy-level pricing of a premium product should generate good load factors and as its unit costs are probably a decent margin below its main competitors it can absorb some pain, at least for an initial period. With a fleet of three all-premium configured aircraft being collectively used for 13 hours a day, there is certainly plenty of room for utilisation improvements. Where frequency is generally important in attracting and keeping premium travellers, this offers some hope. Then again, as some CEOs are fond of saying, no airline has ever gone out of business for flying too little. The Chinese market, however, is certain to display many different features from traditional experience as it evolves. Hainan may have a workable formula, but it will undoubtedly have to be one which is prepared to accept losses over a considerable period as it establishes a position on the very busy routes it has chosen. In the process Hainan Airlines, and all those watching with interest, will undoubtedly learn many new lessons.